Today Operation Safety 91 Founders, Ed and Mary Ganster, were invited to attend the Charity Challenge XXVII Luncheon at the Florida Citrus Bowl. Unbeknownst to us, our long time friend, Paul Benjamin, Founder of Central Florida Dream Center located in Sanford, FL, partnered with Charity Challenge and targeted an overage of the funds raised for the Dream Center to be donated to Operation Safety 91. 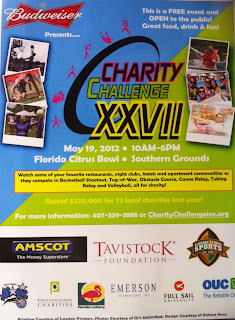 Former Florida State Senator Lee Constantine, founded Charity Challenge to bring the Central Florida community together by providing an opportunity for young adults to have fun and give back to local charities at the same time. Charity Challenge has evolved from a 4 team backyard event into a multi-media extravaganza with nearly 100 teams competing and the loyal support of over 200 sponsors. 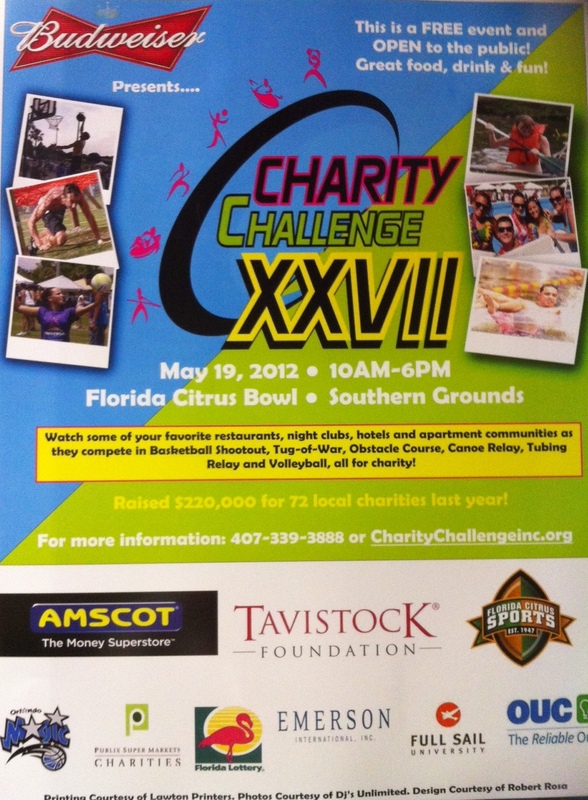 Charity Challenge has awarded nearly $5 million to local charities, including $220,000 to 7 charities in 2011, making it the largest independent charity in Central Florida. Ed and Mary were truly blessed to meet for the first time Antonio Barbosa, Jr., VP/Director of Ministries and Belinda Thrift, Administrative Assistant of the Cental Florida Dream Center, wonderful people with hearts to help others and devoted to the Dream Center's mission and vision. We feel we made 2 new friends, even though we have been working with them (almost without knowing it) spreading the Psalm 91 message through the books of the 1687 Foundation. 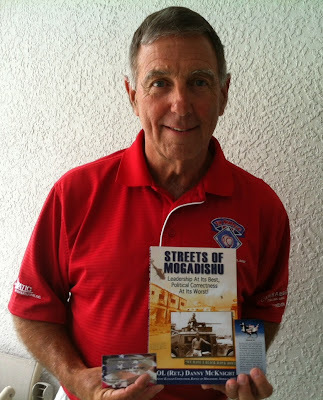 Paul, thank you so very much for your continued friendship and support of us and of Operation Safety 91. 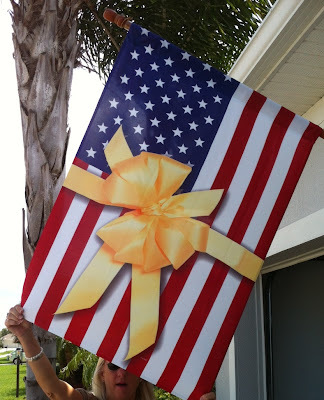 We truly appreciate your gift but even more, we appreciate YOU! God bless and reward you! Operation Safety 91, with other Orlando organizations, corporations and businesses, was invited to the Rosen Centre Hotel this evening to be treated to some exquisite dining and informed all the newest renovations to the Rosen Hotels. As you know, if you have been following us for any length of time, that for the past two years OS91 has hosted the 3rd and 4th Annual Tribute Events at the Rosen Centre here in Orlando. We appreciate Mr. Harris Rosen, a brilliant businessman, generous philanthropist, and former Military, who truly has a heart for OS91's mission and vision. Ed and I had several minutes with Mr. Rosen, and were touched to receive his enthusiastic encouragement and congratulations for what we are doing. I do apologize that the picture is so dark, but I am still posting it. God gave us a special blessing tonight at this Event. Ed began talking to a staff person, Doug Ribley, Assistant Director of Convention Services and Catering. When Doug discovered that Ed was the Founder of Operation Safety 91, he told Ed that he attended the 3rd Annual Tribute and there he received a Psalm 91 card and a Christian Patriotic decal, which he promptly put on his wife's car. Later that year, Doug's wife was miraculously spared, when her car flipped 3 times and ended up on all four tires; she did not have a scratch! Praise the Lord! What a blessing to hear miraculous testimonies of the Divine Protection of Psalm 91! Yesterday Ed and Mary had the honor of another meeting with an American Hero and our beloved National Spokesperson COL Danny McKnight, US Army (Ret.) 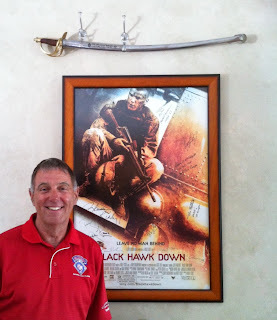 of "Black Hawk Down" renown and his beautiful wife, Linda. We cherish these times spent with COL and his wife, both so dedicated to Responders and to the mission of Operation Safety 91, to honor and protect these brave men and women. During the conversation, Linda told us that she has for a few months now been including one of COL McKnight's business cards as well as a Psalm 91 card in each copy of COL's new book, Streets of Mogadishu. That was music to our ears! COL then invited us to their home! What a privilege! As we pulled up, the first thing we noticed is this Yellow Ribbon Flag pictured below. Of course I had to have a picture! COL McKnight and Linda rolled out the "red carpet" for us and showed us around their beautiful home, the highlight of which is what COL calls "Linda's Room" which is really COL's room...full of memorabilia as Danny moved up the ranks of the U.S. Army and fought for America on foreign soil. We enjoyed a heartwarming moment when their granddaughter appeared; just had to have a picture of that! 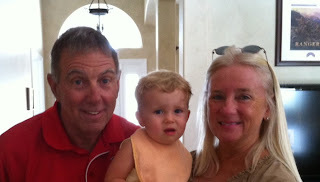 Ed and I thank God for connecting us to COL McKnight and Linda, who have such a heart for OS91's mission and vision. COL does at least 80 Speaking Engagements and Leadership Conferences for Responders all over the U.S. each year and speaks about Operation Safety 91 wherever he goes, always making available our Psalm 91 cards at each Event. 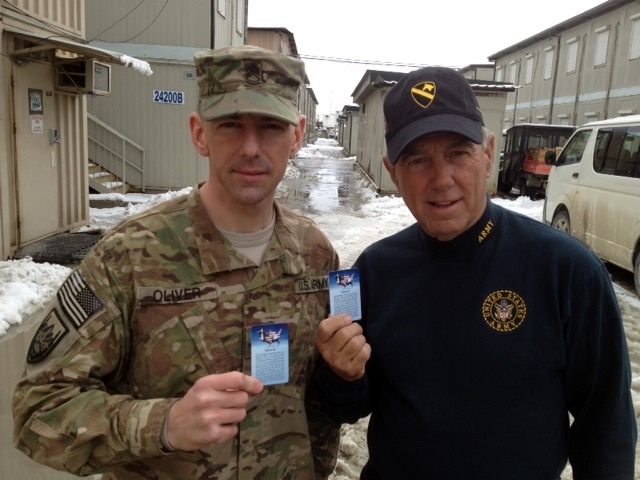 In fact, COL has been to Afghanistan twice this year to be with our brave soldiers in battle and he gave hundreds and hundreds of Psalm 91 cards to them. If you ever have the honor to spend time with COL McKnight and Linda, you will see two people who love our Responders and are giving their lives to reach them. COL Danny and Linda, OS91 loves and appreciates you! What a wonderful Event last evening: National Night Out, held all over the country to bridge the gap between Responders and civilians. Lots of fun (including "Dunking a Cop"), food and fellowship with local Responders. We appreciate all our Responders who help protect, defend and rescue us in our daily lives!